Thanks to Scouter Sandy for her efforts in getting a picture of our 24th Cubs at a winter campfire published in the Scouting Life Magazine! 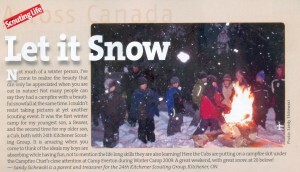 Every Scouting Member should be receiving their own subscription included with their membership. (Sometime it takes a while to make this happen.) There is some great stuff in it for leaders and youth alike. Lets see if there are any more parents or youth out there with pics we can send in.